Mule ESB runtime is light weight java based Enterprise Service Bus, which can be integrated between different platforms and languages that can connect fast and communicate between each other.Mule ESB can be deployed anywhere and can orchestrate real time events. Mule ESB has got below capabilities. Below is a quick ESB selection checklist. To read a much more comprehensive take on when to select an ESB, read this article written by MuleSoft founder and VP of Product Strategy Ross Mason: To ESB or not to ESB. 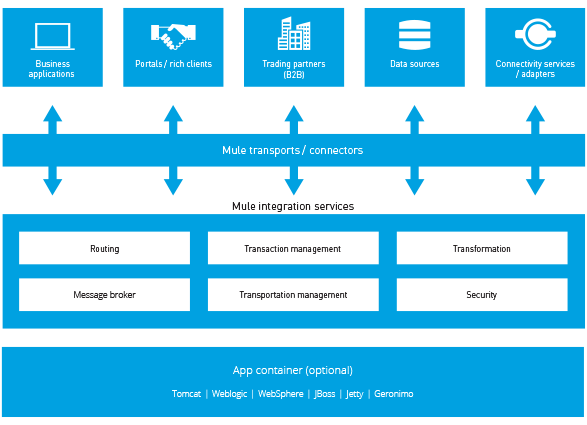 Mule is lightweight but highly scalable, allowing you to start small and connect more applications over time. The ESB manages all the interactions between applications and components transparently, regardless of whether they exist in the same virtual machine or over the Internet, and regardless of the underlying transport protocol used. Note: the above two paras are directly taken from Mule website because i feel thats most apt content than i can describe. In the next comming blog posts i will teach you how to start with mulesoft ESB.